Good Morning America's Dan Harris on Friday filed a report on extreme weather and failed to mention the agenda of a global warming scientist. Elizabeth Vargas teased the segment by fretting, "And coming up next, from killer heat waves to fires to those devastating floods in Pakistan and in Iowa, why all the severe weather? Is it global warning?" Harris interviewed no skeptics of man-made global warming for the piece. He did, however, talk to scientist Gavin Schmidt, identified only as working for NASA. Schmidt predicted doom: "The unusual heat waves, the unusual rainfall events will not be unusual in 10, 20, 30, 40 years' time." Not mentioned by Harris? Schmidt also writes for RealClimate.org, a blog site that has been endorsed by Al Gore and is hosted by the liberal Environmental Media Services. Citing floods in Iowa and Pakistan, Harris wondered, "But these sorts of extreme weather events are getting more common and are predicted to get even more so. So we're looking at a planet potentially where the unusual becomes quite usual?" He did pose one challenging question to Schmidt: "But, skeptics push back and ask what about the huge snowstorms over the winter that crippled Washington, D.C.? Doesn't that seem to argue against this pattern that scientists talk about?" But, no one skeptical of climate change was featured and Harris ended the piece by warning, "And Americans and the world, [Schmidt] says, need to get ready for it." For more on Schmidt, including some critical comments he made about NewsBusters' Noel Sheppard, go here. ELIZABETH VARGAS: And coming up next, from killer heat waves to fires to those devastating floods in Pakistan and in Iowa, why all the severe weather? Is it global warning? GEORGE STEPHANOPOULOS: This winter, we were walloped by snow. This summer, weltering heat. Pakistan fighting its worst floods ever. Russia, its worst wildfires ever. Both sparked by extreme weather. That has put the debate over climate change and global warming front and center once again. And Dan Harris put himself right in the thick of it. ABC Graphic: Summer of Heat, Fire and Floods: Is Climate Change to Blame? 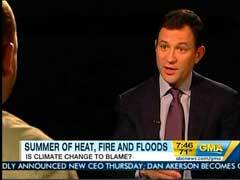 DAN HARRIS: It has been a long, miserable summer all over the planet. Here at home, we've had the hottest year on record. There have been killer heat waves and also those devastating floods in the Midwest. Over in Russia, the hottest summer on record with thousands dead and hundreds of brush fires destroying wheat crops. In Pakistan, the heaviest monsoon rains on record leaving 14 million people homeless. And in the arctic, the largest chunk of ice to break away from a glacier since scientists started monitoring. Add it all up and does it mean global warming is here? Well, scientists say you can't blame any one weather event on global warming. But these sorts of extreme weather events are getting more common and are predicted to get even more so. So we're looking at a planet potentially where the unusual becomes quite usual? 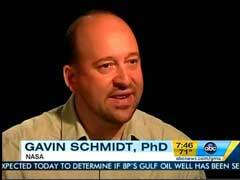 GAVIN SCHMIDT PHD (NASA): That's exactly right. The unusual heat waves, the unusual rainfall events will not be unusual in 10, 20, 30, 40 years' time. HARRIS: And that's a bad thing for a lot of people. SCHMIDT: That is a bad thing for a lot of people. HARRIS: But, skeptics push back and ask what about the huge snowstorms over the winter that crippled Washington, D.C.? Doesn't that seem to argue against this pattern that scientists talk about? SCHMIDT: Well, nobody ever said that it would never snow again. I mean, you're still going to get cold anomalies but they're just going to happen less often. And soon they won't happen hardly at all whereas the other anomalies will come more and more frequently. HARRIS: And Americans and the world, he says, need to get ready for it. For Good Morning America, Dan Harris, ABC News, New York.